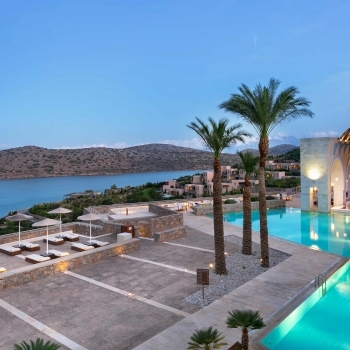 The Blue Palace, a Luxury Collection Resort & Spa, member of Starwood Hotels, is located on the coast of Elounda Greece, opposite the isle of Spinalonga. 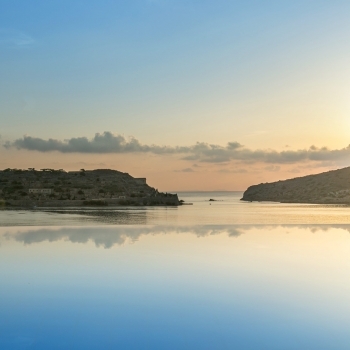 This luxury resort introduces its guests to the famous Cretan hospitality and the beauties of the island of Crete. 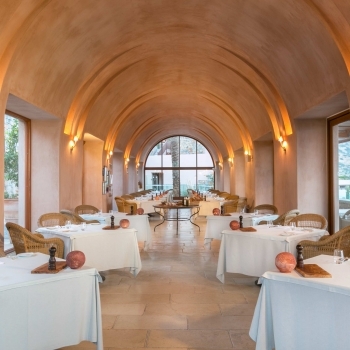 This exclusive beach resort elegantly combines luxurious accommodation and award winning cuisine with captivating spa facilities and excellence in guest services. The Blue Palace Resort & Spa consists of various rooms, suites and villas carefully designed to ensure a relaxing and memorable luxurious stay. Guests are provoked to experience all their senses during their stay at the Blue Palace Resort & Spa. Guests experience the Mediterranean chic design of the outdoor and indoor areas; taste excellent Cretan, Greek or international cuisine in one of the restaurants; take in the sea aura at the resort's private beach or while enjoying a water sport; feel the privileges of the customized guest services that transform a travel experience to an ultimate lifetime experience. Private beach, umbrellas, sun beds, beach towels, beach services, beach bar, 3 main outdoor swimming pools, 2 outdoor children's pools, heated indoor pool, sun beds, sunshades, traditional caique experience, diving and water sports center, full 18 holes golf course 30 mins from the hotel, 2 flood lit tennis courts, fitness center, table tennis facilities, billiard, backgammon, cards tables, indoor and outdoor playground for children, shops, helipad, 5 restaurants, 3 bars. WIFI is available free of charge throughout the resort (low bandwidth). High bandwidth is offered at a charge. Island Luxury Suites & Private Villa guests enjoy high bandwidth wifi on complimentary basis. Wi-Fi internet access, free access local and satellite TV – flat screen TVs, in-bathroom LCD TV (selected bungalows), marble lined bathroom, premium bathroom amenities (bathrobes, slippers, etc. ), twice daily housekeeping with nightly turndown service, welcome amenities, private pools and private verandas (selected rooms & suites). Ultimate guest services, twice daily maid service, diving and water sports classes, fitness classes, private cruise, traditional caique or speedboat taxi transfers upon request, supervised Kid's Club for children 3-12 y.o. 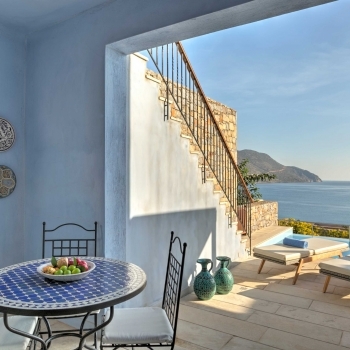 offering activities such as theater, fishing, painting, and Greek dancing, tailor-made excursions and day-trips, cooking lessons, wine tastings. Customer Responses: 221 What's This?